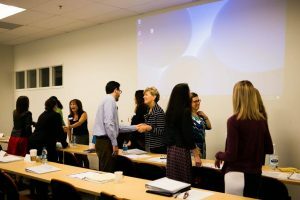 It seemed like just yesterday that VCLA Cohort XXIII had gotten together for their first highly anticipated meeting. As we all arrived for our second meeting, the anticipation and anxiety over what to expect had long disappeared. Instead, we were hugging, laughing and looking forward to our field trip to HAAS Automation for the HAASTec event that only happens once every two years. In true VCLA fashion, it wouldn’t be a VCLA meeting without the morning activity from Dr. Rick Eberst (Cohort XVII) Co-Chair, VCLA Internal Committee. This month VCLA members were tasked with coming up with a profession that rhymes with your name. It’s an activity that truly pulls you out of your comfort zone and makes you say…” hum”. We had pizza eaters, tarantula tamers, bakers, and money makers. Lots of laughter and camaraderie building going on. But most importantly, team work, collaboration, and support. Living in Ventura County, #1 in the nation out of 3,111 counties for physical characteristics that enhance location as a place to live, “the absolute most desirable place to live in America,” is truly like winning the lottery every day. We have much to celebrate but we also have much to fix. In part one of our Quality of Life session, we found out that despite being the most desirable place to live, we are also a county that lacks housing, especially affordable housing. In addition, our job growth has also long lagged behind the state, wages are not rising, and our labor force participation is far behind our slow rate of population growth. 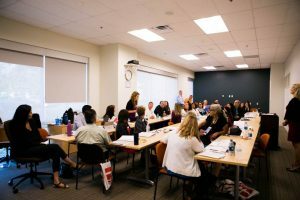 As a group of leaders within the county, it’s an eye-opener hearing what the problems are. Knowing that organization and individuals are out in the community assisting those that need help is a rewarding feeling. 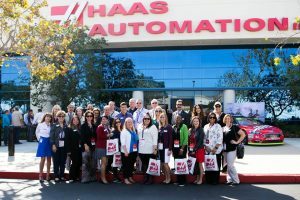 Haas Automation is the largest machine tool builder in the western world and a local entity here in Ventura County. I pass that HUGE building on my way to work every day and had never had the opportunity to actually tour it. VCLA Cohort XXIII was fortunate enough to be invited to participate in HAASTec. We received a special welcome from Kathy Looman, Foundation Administrator. On this tour, we were able to see what exactly goes on in this amazing manufacturing facility. 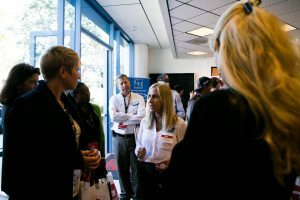 People from all over the world, Turkey, Spain, Bulgaria, Slovenia, just to name a few made their way to witness firsthand how the machines that build machines work. Thanks to all involved in making this tour a reality. As we returned from our field trip at Haas Automation, we were in awe of what is right in our own back yard. As we began the second half of our day, we were met by two brothers that are changing the way we do business. The Went Brothers from Matterlabs inspired us to look at our world and see how we can be a contributing factor of change. We ended our day with a Happy Hour gathering at Institution Ale Company in Camarillo, and that gave us all the opportunity to connect on a personal level. There we celebrated the creation of “GOAT” – Greatest Of All Time”. Yes, that is our cohort name and we’re sticking to it. VCLA Cohort XXIII – 23- joins the ranks of those like Michael Jordan. I don’t know group, maybe some shirts with a GOAT on it??? I think I see that in our future. 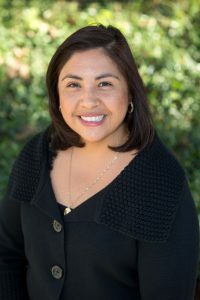 Eva Gomez is Director of Annual Giving and Special Gifts at California State University Channel Islands, the first 4-year public university in Ventura County which opened its doors in 2002. As a friendraiser, fundraiser, she is responsible for bringing community support of higher education for the students of this region. She is a California State University Channel Islands graduate as well as a California State University Long Beach grad, having received her master’s in Public Administration. She is a lifelong resident of Ventura County and lives in Oxnard with her husband Armand and her son Evan.